Flu Vaccine Prevents Deaths. Last year 80,000 people in the USA died from complications of the flu. Get your flu vaccine today. If you are afraid of vaccination you, especially, should watch this video. I can talk till I am blue in the face about how vaccines do not cause autism and some people just don’t listen. 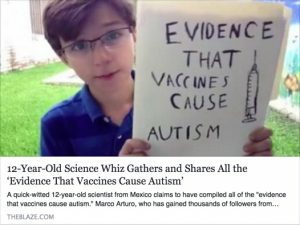 But, let a twelve year old genius go on the internet and tell you all the reasons that vaccines DO cause autism and he gets millions of views in one day. Maybe I’m just wrong. Sure, it’s a little affected to title an article referencing an Ibsen play; but the similarities are too great. In that play, a doctor was darling of a community until he did not do what the community wanted. This is similar to what is happening to healthcare workers who treat Ebola patients. What bothers me is how she was apparently being treated. According to her she is being kept in an unheated tent outside of Newark Airport and being given nothing to wear but hospital scrubs. Where are we, in Liberia? Obviously the fear and “cootie syndrome” created by one doctor who tested positive for Ebola and roamed the streets of New York while possibly contagious, has caused politicians to act rashly if not illegally. Without knowledge of Ebola and the science that surrounds it, they have caved in to public frenzy and have jumped the shark. They had no plan of action as how to quarantine anyone exposed to Ebola, except to isolate them. They have no definition of what “exposure” is. Does someone sitting next to someone on the subway who turns out to have Ebola count as an exposed person? Will they then be quarantined? Where does it end? They don’t know. They are playing it by ear. That is a scariest thing. I do know one thing, in the long run this type of quarantining may be increasing EVERYONE’s chances of getting Ebola. Soon few doctors and nurses will go to western Africa to treat patient’s with Ebola if this is what awaits them upon their return. You cannot expect good Samaritans to risk their lives to save us all and then accept being treated like lepers upon their arrival home. But don’t we quarantine people with dangerous communicable diseases all the time? The answer is yes. The HUGE difference is that we do that once we KNOW they have a communicable disease, not when we just suspect they do. You may think that the stakes are higher here because Ebola is so dangerous. But as of now no one has died from contracting Ebola in the US. Which causes me to have a huge moral dilemma. I believe in quarantining health care workers on the honor principle as a way of stopping spread… but I do not agree with the way it is being done now. However, there may be a solution. The solution once again is science. There is a test that is used both to detect and follow the progression of HIV. It is called the PCR (polymerase chain reaction) test. It is also used to test for progression of the Ebola virus in someone’s body. If you do not have Ebola in your blood this test will be negative. It is not like the antibody test that can take days or weeks or months to be positive. If you do not have the Ebola genetic material in your blood this test will be negative. What I have not been found in the medical literature is how soon after you are infected with Ebola will this test be positive. If this test is positive within a day or two after infection then problem solved. When a health care worker returns to America from an endemic area he or she should be given an Ebola PCR blood test and then be placed under home observation, in his or her own home. They must report to health authorities twice a day after that. They must have a PCR test every two to three days. If they have successively negative PCR and do not develop symptoms after a set period of time that “science” has determined to be safe, they can then be released from observation. That is of course if we know that my theory is correct. Regardless, I hope that the government is taking Ebola PCRs form all health care works returning from western Africa so that we can learn more about the natural progression of this disease. If not, they should create a voluntary research protocol that does this. If it looks like I have reversed my position on mandatory quarantine, I have! After seeing the reaction of the public and the government, I am now much more concerned about the frightened town’s people storming Frankenstein’s castle, than I am of the virus. I am a virophobe, someone who fears viruses. Having treated people with HIV and Hepatitis C for my entire medical career I know the danger of these submicroscopic entities. Not really animals because they don’t have more than a strand of DNA or RNA, they survive by infecting a host and using it’s genetics to replicate. Therefore, the virus survives and host dies. Nature could not have created a more efficient killer. Of course not all of them are killers, some like the Influenza virus make you ill and most people survive. But even the flu virus kills tens of thousands of people a year in the USA alone. That is a tremendously high number. Science has found that viral illness can be cured, as the recent breakthrough in the treatment of Hepatitis C proves. But this is the rare exception. I remember hearing about H1N1 in Mexico five years ago and thinking that if a vaccine was not found immediately deaths could be in the thousands. Luckily there was a vaccine discovered and mass immunizations were successful. (Don’t even get me started on the ignorance of people who fear vaccines.) Now there is a greater threat on the horizon, the Ebola virus. It is not a matter of if it gets here, it’s a matter of when. Ebola is a quick acting virus that causes the body to be unable to clot and up to 90% of the people who contract it eventually bleed to death within a few weeks. Whereas Ebola used to be contained to small villages in Africa, where the treatment was to isolate the whole village and let everyone die so that the virus could not spread, it is now spreading through four countries in western Africa. This week, an American returning home to Minnesota, died in Nigeria on his way home. He could have easily landed in the US and the epidemic would be in our back yard; probably to spread like wild fire because the public has not been educated about how to curtail its spread. Let’s learn from HIV and Hepatitis C. We are not alone in the world. This is not “their” disease. This is “our” problem. This is not just about Africans in a distant land, expiring of a rare disease. This is a wildfire that is potentially about to take off. The time for the CDC and WHO to take action is now. Worldwide deaths could easily be in the tens, if not hundreds of MILLIONS. It is my opinion that airlines should not allow ANYONE to travel who has a fever. It may be extreme but some countries have been doing this for years during the outbreak of other viral epidemics. Secondly, Ebola vaccination research needs to be stepped up immediately. Thirdly, and most importantly, since Ebola cannot spread through casual contact, there must be a concerted global education effort to teach people about proper hygiene that will help prevent the spread. I am not trying to be an alarmist, just sending a wake up call. Ebola is here. But if being an alarmist will eventually save lives… then I’m sounding the alarm. I LOVE talking and writing about vaccines…just LOVE it. Especially since a lot of my friends in earthy, green, tree hugging California, where I happen to live, are against vaccinations. I am a medical doctor and excuse me for giving advice based about scientific data. (Do you sense the sarcasm yet?) Here is some data: vaccinations, for whooping cough, polio, tetanus, hepatitis and diphtheria, just to name a few, have saved millions of lives. FACT. I believe it is almost criminal for people who do not have a sense of this history to make erroneous claims regarding vaccines and in turn persuade others not to vaccinate themselves and their children. This type of “magical thinking” has lead to a resurgence of diseases that were almost eradicated. But let me stick to one type of vaccine before I fall off my soap box: the flu vaccine. Flu season is upon us and if you’re like a lot of consumers, you may be wondering if the flu shot is worth the hassle, pain and potential risk. Google “Is the flu shot safe?” and you will find a plethora of information that is muddled in myth, rumor and exaggeration. I thought I’d take a moment and address some of the most common myths about the flu shot…. It can give you the flu. This is absolutely false. Most versions of the vaccine contain inactivated strains of the flu virus — meaning it is dead. It cannot cause illness. The nasal spray does contain a live form of the virus but it’s attenuated, which simply means that it’s weakened and it cannot thrive within the warm conditions of your body. Patients who contract the flu shortly after getting the shot were likely already infected or came into contact with the illness before the vaccine was effective — it takes up to two weeks for the vaccine to build immunity in your system. It’s linked to Alzheimer’s. This rumor has been disproven in multiple studies that actually show the opposite may be true — individuals who get the flu shot may have a reduced risk for Alzheimer’s disease. The Alzheimer’s Association also says there is no credibility to this common myth. It’s not safe for pregnant women. Studies show that women are at greater risk for complications from the flu while they are pregnant than when they are not. The antibodies mom builds up from a flu shot during pregnancy have also been shown to benefit her baby while in utero and protect her precious bundle from serious flu related complications after birth. It doesn’t work. Sure, it’s not 100 percent effective — nothing is — and its effectiveness varies from year to year. 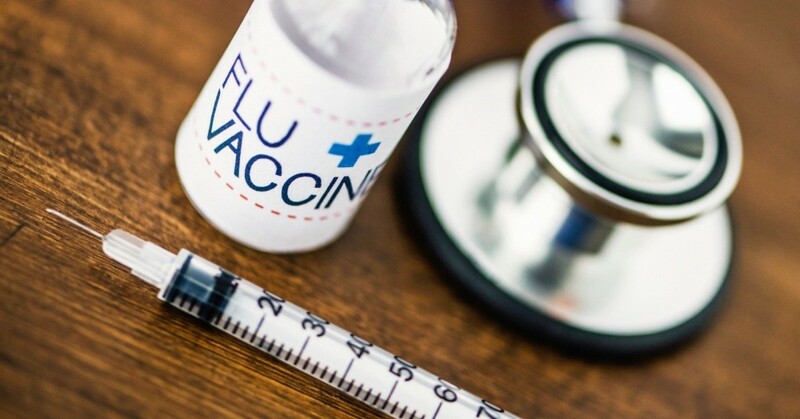 But a recent study shows that even in seasons when the vaccine isn’t a complete match to the strains circulating, the flu shot is still effective for the majority of the population. It has also been shown to reduce the severity of the illness for those immunized patients who still catch the flu. It can give you Guillain Barre Syndrome (GBS). There was a time when this was a concern. Back in 1976 there was a “small but significant association” between GBS — a neurological disorder than can cause weakness and temporary paralysis — and a vaccine for the swine flu. Vaccines are formulated differently today and recent studiesshow no link between the illness and the flu shot. It contains mercury and it causes autism. Many naysayers point to the mercury contained in Thimerosal — a preservative that has widely been discontinued in vaccines — saying that it can cause brain damage and autism. While it’s true that methyl mercury can cause brain damage, it’s completely false when it comes to the ethyl mercury contained in Thimerosal. The differences can be likened to those between ethyl and methyl alcohol. One might cause a hangover, the other blindness. Furthermore, all single-dose vials of the flu shot are actually Thimerosal-free and studies prove that the preservative is absolutely harmless. Everything that we do contains some element of risk and the flu vaccine is no different. Still, study after study show that the risks are minor and very insignificant. 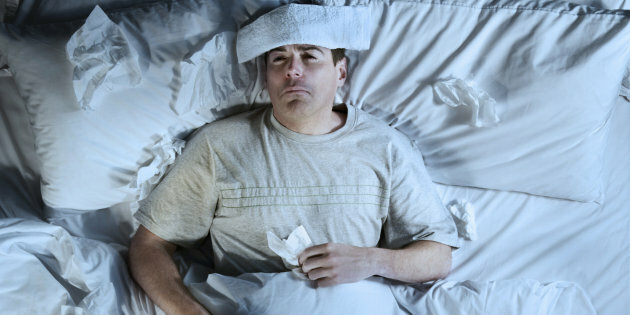 The flu on the other hand can be miserable at the very least and absolutely deadly for some. Recently, flu-associated deaths in the United States have been as high as 49,000 in one year. This is nothing to SNEEZE at! Weigh in… have you had your shot yet?